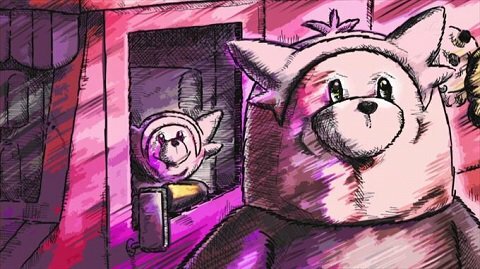 Would you want to see Silver have an important role in the Pokemon anime? Discussion in 'Pokémon Animé Discussion' started by shoz999, Nov 1, 2018. Would you want to see Silver have an important role in the anime? Silver is arguably one of the more interesting rivals of both the games and manga because Silver is the son of Giovanni, the leader of Team Rocket. He only appeared in a cameo appearance in the anime, briefly mentioned by Jimmy and that's really it. He's portrayed as a jerk rival and nothing more. In the games, it's revealed in HGSS that the reason for Silver's hatred for Team Rocket has to do with the fact of Giovanni abandoning him, explaining that he failed to utilize his men to the fullest potential. This was actually hinted at in FRLG by a Rocket Scientist who claims that Giovanni's son is a red-haired boy. 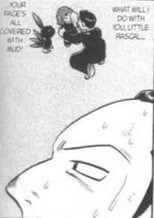 What you may not know is that this was actually confirmed first not in the HGSS games but in Pokemon Adventures FRLG Chapter where Giovanni eagerly searches for his son. It's quite an emotionally intense reunion, especially for Silver. In fact a reoccurring theme for Silver is that he seeks revenge on his enemies and this becomes troublesome for him later when people start comparing him to his father, Giovanni, the leader of Team Rocket. 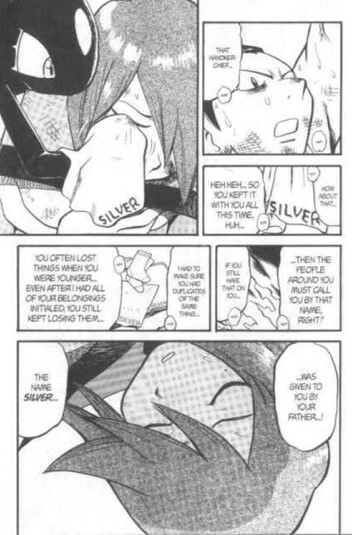 Like the games, Silver of the Adventures manga hates Team Rocket and whenever Silver realizes that his decisions rooted from his anger is similar to Giovanni's anger, he decides that he has to change starting by forgiving an old enemy who ruined his life earlier and in turn hope that his father will change despite Giovanni's decision to continue Team Rocket. A Short Family Reunion. Who gave Silver his name. I think most of you guys can easily tell from the pictures and written examples above that Silver having a full-fledge role in the anime would really impact the plot for years to come, especially Giovanni who has never had any real character development in the anime. On one hand though, it would be kind of weird to see Silver interact with Jessie, James and Meowth lol. I know Team Rocket has it's goofballs but it would still be weird if Jessie, James and Meowth got caught up in Silver and Giovanni's little reunion and it's kind of expected as Team Rocket plays a huge role in Silver's background. On one hand we would get to see how loyal the Team Rocket Trio is if Giovanni ever entrusted them with a mission to find his son. I suppose a lot of you anime fans could say Paul has taken that role but I'd say not really. First, Paul actually reminds me more of Green/Blue, Red's rival, from the games and manga than he does Silver. Second, Paul isn't Silver. Paul is the younger brother of a genius Pokemon trainer who decided to become a Pokemon Breeder after one major loss. Silver's reasons for seeing Pokemon as tools and hatred for Team Rocket is far more complicated than that. Third, in terms of design, although Paul does share a similar shape to Silver, it pretty much ends there. Other than how their shaped, they have a ton of differences that make them stand apart. So other than that, I don't think Paul would be a problem for Silver coming onboard. So pretty much, there really isn't much of an obstacle for Silver not to appear in the anime. The only obstacle I suppose is how the writers would have to actually plan how Giovanni and the Team Rocket Trio would fit in all of this. You know Jessie, James and Meowth has to be apart of Silver's story because they pretty much represent Team Rocket to children everywhere. I suppose the other one would be Ash & Co. I can easily see Silver making up as one of Ash's rivals. Also I honestly wouldn't be surprised if the anime crew just ditched Silver's cameo in favor of an entirely new Silver. They've done it before with Jimmy and Ethan, they literally seem to have completely forgotten about Jimmy so I don't think it would be too surprising that they forgot a simple cameo. In fact I suppose the only real problem is the fact that Silver is a Gen 2 rival and we are nearing Gen 8. Other than that, there's a lot of story-changing potential for Silver to appear in the anime. It's far too late for Silver tbh. SinnohEevee and LilligantLewis like this. After what happened to gladion and alain, they will tone him down as well. Manga has some mature contents due to demographic age being higher, so they put some very serious moments which i doubt will be there in anime. Otherwise there are many things in manga that could be benefitial to the anime and could bring back old viewers. Wasn't paul supposed to be inspired by silver. Yeah, I mentioned it in your another thread. 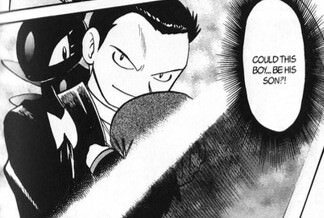 It's strange like the anime totally ignored Silver, being the GSC rival and Giovanni's son. Most Rivals haven't been featured. And we didn't know he was Giovanni's son until Gen IV, long after he would've appeared normally (aka in Johto). I mean, he could've shown up in Sinnoh, but we already had Paul. It would've been redundant to have both. Actually if were discounting cameos, it would be Silver, Wally, Cheren (Gym Leader role doesn't count) and Hugh. I wouldn't really count Calem since Ash literally fills that role by clothing and story but that's more of a personal opinion though. If I had to redo the whole OS Johto segment, I'll have him combine with Cross from I Choose You. Silver is really a more immature, emotional Paul and thus would not work against a much more experienced Ash. He could only work if Ash himself (or another protagonist) is an inexperienced trainer who neither knows the extend of cruelty that other trainers will go nor be super confident in his own method of friendship and trust. Paul works for Ash in DP because he does not show obvious weakness or needless cruelty to others. Thus it's harder for Ash to simply dismiss his opponent as being wrong. This is where Cross' personality really comes into play. Yes, he's like Paul in many ways, but is also an insecure child who wants to prove himself to Ho-Oh despite not being pure of heart. We don't get much about him other than he's likely from Alola, but the fact that Cross can be sympathetic and, in the end, proves himself to be a kinder person than he lets on, is a nice blueprint for Silver. Combine that with daddy issues with Giovanni, you got some great potential. ash&charizardfan and Spider-Phoenix like this. Oh god yes. Any way they can put him in for an EIC rivalry with Ash next season? You know, if they someday introduce Silver in the anime, I would like to see Leaf too, confirming her part of the three others trainers from Pallet Town along Ash and Gary. SinnohEevee and Redstar45 like this. Having silver in the anime would definitely make the series more interesting, especially the interactions with ash, though silver shouldn't be the total copy of paul but the story of him being son of giovanni should be mentioned and his hatred for TR. As for leaf her chance to appear in the main anime was during kanto remakes and they should have given her a cameo just like with lyra during DP, now i dont think she is gonna appesr again. I think Paul was based on Silver. Yeah, if he would've showed up in the anime it would have been in DP. It's a shame since he's one of my favorite game characters (mostly due to HGSS). At first I though you were talking about Silver from SS18 "The Heavenly Legend! Ritchie and Moltres!" (the guy everyone thinks is Ash's Dad). Had Paul not existed, yes. And because of TR still being around, it makes things a bit weird. LilligantLewis and 04n70n10 like this. Don't remind me of all the wasted potential BW wasted.